Oh Mark, I did not mean to neglect you. I am sorry for the affairs with Bon Appetit, and I know that cooking around with Hungry Girl was truly crossing the line. And I cannot promise it will not happen in the future. I confess in being poly, I need the content from cookbooks, magazines and blogs to be truly satisfied in the kitchen. But you will be my main cookbook man. And I gave you the benefit of the doubt, trying a dish with yogurt in it. I don’t normally care for yogurt so surely this gesture shows how much our relationship has come to mean to me. 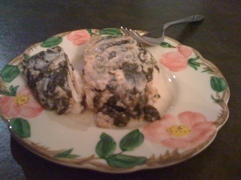 I tried the baked version of your spinach with fresh cheese an yogurt. I used the mozzerella option instead of fresh cheese. I did not have garam masala so I made my own mix of spices: heavy on the coriander and cumin, accented with cinnamon, cloves, turmeric and freshly ground black pepper. 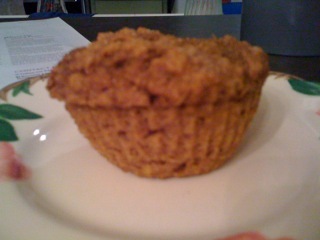 And instead of a quarter cup of oil I used 1 1/2 Tablespoons of Smart Balance to toast the whole wheat flour in. This roux, mixed with the yogurt, cheese, spices, and blanched and shocked baby spinach was warming and delish.I promise not to forsake you for so long again, dear How to Cook Everything Vegetarian cookbook! I had kale and potatoes in my CSA delivery and so I said aha! 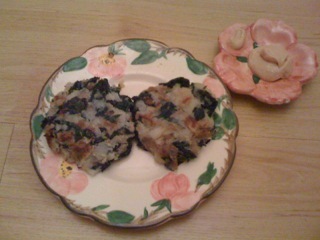 I can make the Kale and Potato Cakes with Rouille ! I like it when things work out like that. If you click on the link, you will be able to go to the Bon Appetit page. I know, I know, I am sorry my darling Mark Bittman, I forsook(sp?) your cookbook for my magazine. I did make two minor alterations-fat free vegan mayo for mayonnaise and garlic powder instead of pressed garlic(gotta buy me one of those garlic presser gadgets)in the rouille. So why too delish? I had a whole plate of leftovers. I offered some of these to my friend when he came over to study French with me. I am re-learning French because I am counting on a future that involves a lot of trips to the Cannes film festival for my work and Paris for fun. I love food that is cute. Any food with a shape counts. 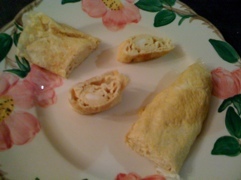 So when I saw the Egg Roll variation on Japanese Egg Crepes in (can you guess?) Mark Bittman’s How to Cook Everything Vegetarian I knew I had to make it. Plus I have been trying to eat lots if eggs because they are excellent brain food. The recipe begins with making a dashi. Bring 4 cups of water, some dried kombu and a few slices of ginger almost to a boil. Remove from heat, take out kombu, let the ginger sit a few minutes then strain. Take 1/4 cup if dashi and mix with 2 tsp. soy sauce, 1tsp. of sugar, a dash if salt and six eggs. Then heat a small skillet over medium heat. Mark says to oil the pan but I used a spray. Pout in a couple of tbsp. of egg an spread into a crepe filling up the pan. Once it looks pretty set, roll from front if pan to back. Pour in more egg an repeat, this time rolling from back to front, rolling the new egg crepe around the first. Do this one more time then remove. Repeat with the rest of the eggs. Slice rolls and eat em’ up yum! You’ll get about four rolls.